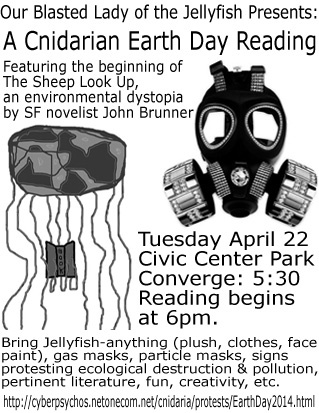 To celebrate Earth Day 2014, and to protest the destruction of the earth that rightfully belongs to the Jellyfish, we read the beginning of The Sheep Look Up: a 1972 environmental dystopia by SF author John Brunner. We also debuted Handy Cnidarian Booklet 5, with a special Earth Day bent, at the Reading and doled out free copies. Hosts: St. Sailing, St. Young, Dr. Woodman, and Dr. Babushka, with an assortment of other Cnidarians. An Event Report is in the works. 'Til then, here's an imgur photo album with random cryptic commentary. About John Brunner: Unfortunately he's dead, but both The Sheep Look Up and Stand on Zanzibar (an overpopulation dystopia) earned him the status of a Patron. Street of Cnidaria. That does NOT mean we posthumously converted him to Cnidaria (we are not Mormons), it simply means we have a great deal of appreciation for him. He wrote numerous other SF novels as well, many of which are quite worth checking out. You can probably read about him on Wikipedia, or go to a nearby indie used bookstore.